This DOK Universal Charger is where convenience meets technology and makes life even easier than ever before. Unless you've recently landed on earth you're likely aware of the Amazon.com Echo which hosts the Alexa Voice Service (AVS). This is an amazing service that connects potentially hundreds of smart device applications to your voice commands. Imagine just waking or working around the house, press one button and calmly speak "Alexa, play classical music." And in seconds your unit is playing classical music. But it doesn't stop there! Just a handful of examples include: ask for the weather or time anywhere in the world, connect Alexa to your smart device radio stations, music channels, news, power outlets, thermostat, place orders with capable services and the list goes on. Hundreds of companies are modifying their applications to be compatible with the AVS and you'll be amazed at the possibilities! As proud as we are of incorporating Alexa into our DOK unit, we are just as proud at making your life easier by providing you with a central charging station where you can charge up to five devices at the same time. You can also listen to one of your devices while charging all five. Charge phones, tablets, pads and more. Most anything you can normally charge with a USB cable connected to your computer will also charge when connected to our DOK Universal Chargers. Each charger has traditional USB slots you'd find on any computer or charging adaptor. Even more, we've added Bluetooth capability to connect your smart devices wirelessly to get even more out of our chargers. From a distance you can play your phone's music on the high quality speaker system and fill your room with music. ORGANIZE / Charge any 5 portable media devices including phones, tablets, pads and more, simultaneously, in one location. 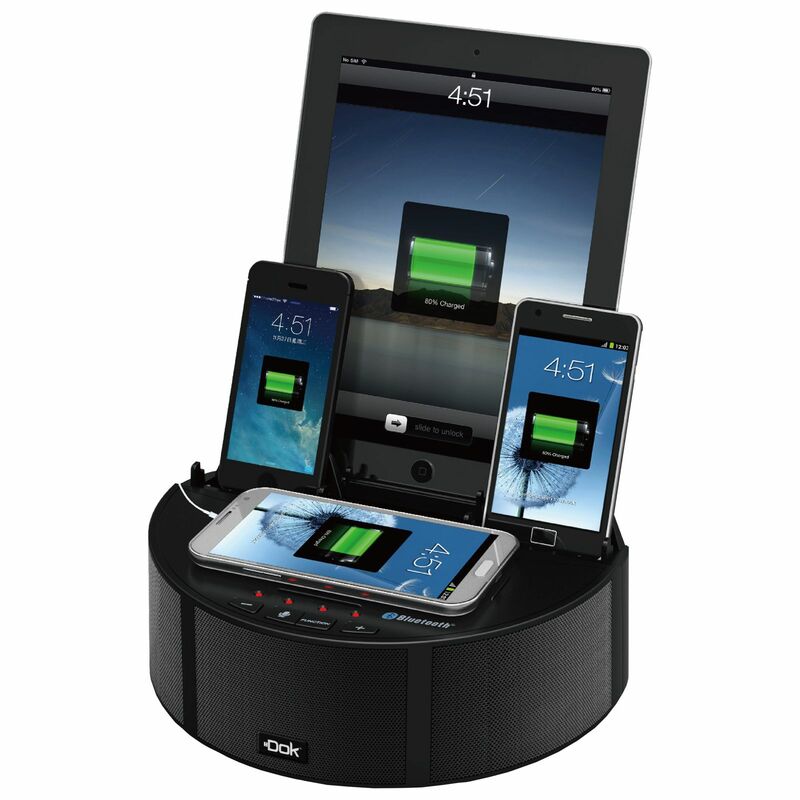 PLAY / Display and listen to one device on DOK's speaker system while charging up to 5 devices.